This morning I made a trial run of cooking teurgoule normande, the dessert to be served as part of a menu of specialties from the region of Normandy at our Quarterly Chefs Dinner Tuesday March 20, 2018 at Café Presse. 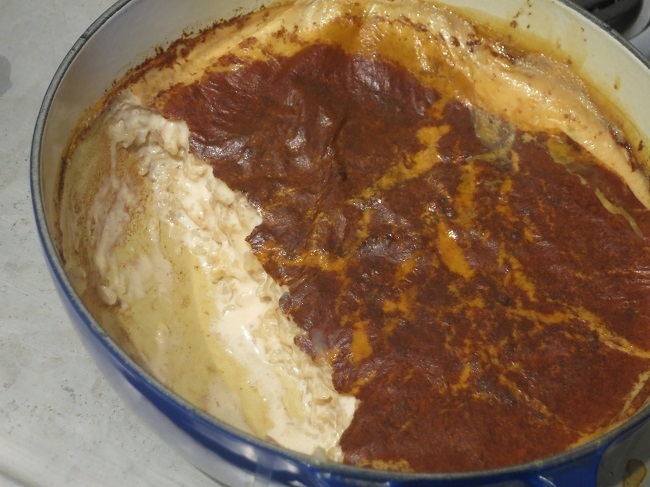 Teurgoule is a traditional, grandmotherly dish made with raw whole milk, short grain rice, sugar and cinnamon, baked in a heavy earthenware dish for 4-6 hours in a low oven. Although not very photogenic, this was more than compensated by the wonderful aroma that filled our apartment all morning while the teurgoule slowly cooked. It smelled exactly as if I were baking snickerdoodles! Although I had heard of teurgoule and am aware of its iconic place among sweet dishes from Normandy, this is the first time I have cooked it. Yum! This entry was posted in Stuff and tagged Cafe Presse, desserts, Normandy, Quarterly Chef's Dinners. Bookmark the permalink.